It was very cool. Very, very cool. For the first time I got a little bit of a simple intuitive feel for what the basic climate pattern is for this century. The overall game has three main data points with regard to climate, which are 0.75 °C — 1.35 °F — (how much temperature has risen since pre-industrial conditions), 2 °C — 3.6 °F — (what we can’t afford to go beyond) and 4.8 °C — 8.6 °F — (where we’re going to be in 2100 if nothing is done to change today’s patterns of emissions growth — what they call the “Business As Usual” or BAU projection). Remember what we’ve talked about here on The Benshi at length — how good stories and good scientific investigations and good documentaries all have at their core a single clear question. That’s exactly what makes this simulation exercise so effective. You know from the outset what’s at stake and what the goal is. There were about 20 people in the room who were divided into three groups — the Developed Nations, the Rapidly Developing Nations, and the Slowly Developing Nations. I ended up in the Rapidly Developing Nations (China, India, Indonesia, Brazil, etc.) and further assigned to the subgroup representing China. The assignment was to figure out a few key variables for your group, namely in what year are you willing to stop increasing carbon emissions, in what year are you willing to begin DECREASING carbon emissions, how much money are you willing to give to an international fund to mitigate emission impacts, and a few other variables. After haggling for a while, the groups then report what concessions they are willing to make. At the core of the entire exercise is a computer model, dubbed “C-ROADS”, into which these values are entered. What’s great is that the model responds immediately to the choices you enter. As the Rapidly Developing Nations agree to halt emissions growth in 2025 instead of 2040 you can instantly see the temperature in 2100 drop a few tenths of a degree. The Coolest Thing About the Climate Interactive Simulation: They update this figure with where the world currently stands in addressing temperature in 2100. As you can see, as of April 29 things are not looking good for your grandchildren. 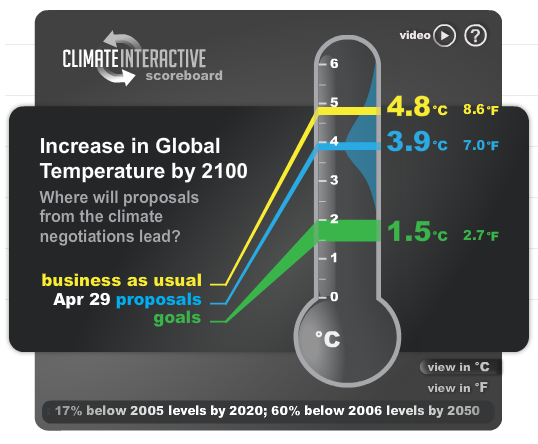 The negotiation process runs in cycles as the groups get to watch the temperature in 2100 slowly drop, but actually getting it to rise no more than 2 degrees C (3.6 °F) turns out to require A LOT of hard work, compromise, and concessions. And then John throws a wet blanket on the process by telling in detail about what he saw last December when he attended COP-15 in Copenhagen, where a global agreement to cut greenhouse gas emissions, once again, eluded the nations of the world. He closes, however, with a hopeful story about both the opportunities to reduce emissions through new technologies and what it will take to create the political and social will to implement them. The answer from all the panelists was an obvious “no,” prompting me to describe to the audience this clip from Monty Python’s “Life of Brian,” which I think paints a pretty accurate picture of what exactly has happened so far in response to Climategate — namely a lot of academics wringing their hands, outraged with a lot of discussion, a lot of thinking, a lot of PANEL discussions, and alas … a lot of nothing. If another load of emails gets stolen, you’ll have the same science bloggers running to the same blogs to convey the same outrage while issuing the same assurances that there’s nothing to this. May 17 will make six months since Climategate.